It's nice to work on a one-frock collaboration with 'personal style blogger' Vivienne Shui of vivalaViv. Vivienne has what seems to me to be a completely unique fashion blog. She uses either newly created; or existing images from her large photographic archive of her modelling-dresses-from-her-personal-collection. These carefully art directed images are the springboard for beautifully written short stories about her relationship with the dress that is being presented. How or why it was purchased, where it was first worn, even inspiration behind buying a particular dress in the first place. What you might call a real history of personal fashion! Although Vivienne had photographed this dress before, the styling for this shot was decided on by myself at her invitation. 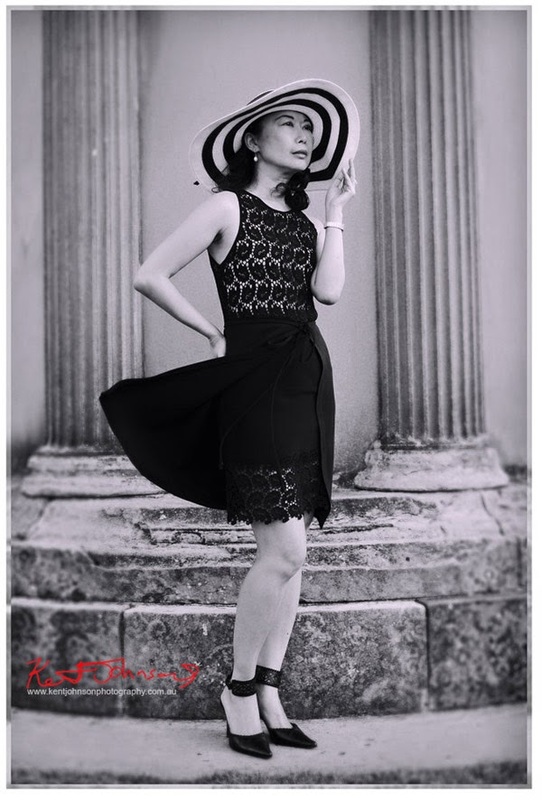 My idea was to put the large circle stripe sun hat with the black lace dress and the selected shoes, primarily for their black lace cuff as a stylistic match with the lace top and wide hem of the skirt of the vintage SPAZIO dress. The pictures were taken on location in Sydney's Royal Botanic Gardens late October 2013. On arrival at the gardens I immediately took advantage of a splash of reflected light on the The Governor Phillip Fountain, simply because it was too good to resist! But Vivienne had already decided that we would photograph against the sandstone monument down at Farm Cove, the Choragic Monument of Lysicrates replica. This is a monument I love, however I was wary of photographing in front of it having produced one of my all time favourite fashion images in front of it back in 1988 using both Hasselblad 500CM and a vintage/antique Ensign 6x9 camera(s). I suppose I am somewhat superstitious and wary of tempting fate to deliver two superb images at exactly the same place! But the time had come to photograph here again, for both of us as it turned out.. The picture selected for the vivalaViv blog post. Light-splash, reflected of a Sydney skyscraper. The fountain shots were made with Vivienne's own Nikon D90 (just because..) and the sandstone monument pictures were made with my Fuji X-Pro1 as mentioned earlier. All the images as can clearly be seen have been processed a little differently, all were finished in Photoshop, fountain pictures Nikon RAW converted in Capture NX2; with only the final selected vivalaViv image being photo finished from the Fuji RAW file, RAW converted in the dedicated Silkypix software. All the other Fuji images are 'developed' from the X-Pro1 nearly-as-good-as-RAW JPEG files. You can read the story of the dress, here VivalaViv - One Dress two Looks. And for those who have read this far, here's a link to that shot I mentioned from 1988, it seems the wind was blowing a gentle breeze on both days all those years apart! Adriane - Royal Botanic Gardens Sydney. Need fashion shot on location? Call me, Kent Johnson 0433 796 863- Sydney Australia. In the studio - Evan - Male Model Portfolio Shoot. 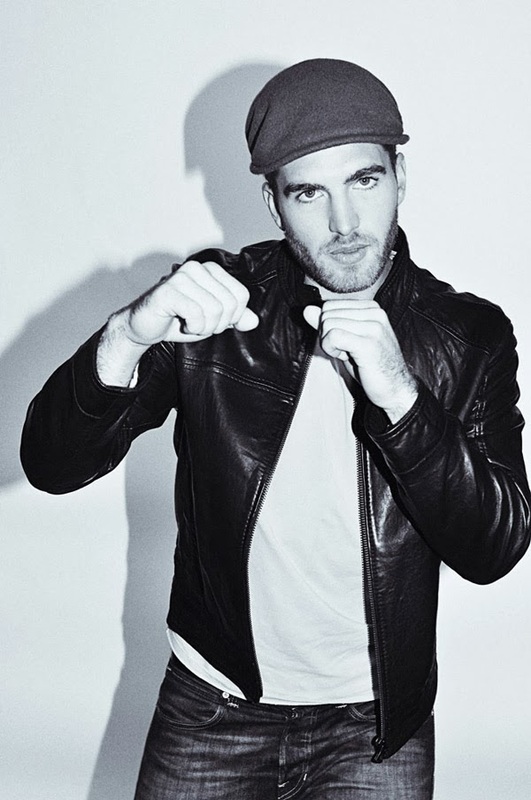 I love shooting male model portfolio's. The principle is the same for men's shoots as it is for women's. To get the best pictures of the model possible; not just good shots, great shots; that principal is always the same. And can I assume I am doing something right when one male model recommends to his brother to have me shoot his portfolio for him? I think the answer is a plain and simple yes. Thanks Cole for the recommendation. So here's my shoot with Evan, I worked through classic studio black background and white, and then decorated the set with the Hessian fabric and some grey paper for some eye catching commercial body shots. We did sport and shadow boxed; we went smooth corporate suit with good positive attitude and pulled a great headshot along the way. We got the shirt off, put the vest on for some cool body shots and finished up with a smart casual look in a pin striped shirt grey pants and driving cap. Click here for more Male Modelling Portfolio shoots. See model portfolio packages here, Call or email to book your portfolio shoot. The Art of Bridal Fashion Photography on Location. Whenever I meet people and tell them I am a professional photographer, I am very often asked if I photograph weddings. After I reply "not very often" or "only for friends really"; I am then asked why not or what I do photograph. Well as anyone who follows my blog here will already know my main work as a photographer is shooting fashion. And of course, bridal wear, bridal gowns, mother of the bride, bridesmaids dresses, these are all fashion too! Curiously (or perhaps not) both wedding photography and fashion photography are very specialised fields with some overlapping, but quite different skills sets. It's very much like I have written about in my last blog post on the difference between a Models Headshot and a Portrait; the big difference is how the pictures are to be used, what they are for - Bridal Fashion photography equals Selling Wedding Gowns; whereas the wedding photographs can range from simply documenting the day to, it's own kind of declaration of Love the Extravaganza now-in-pictures! My wedding photography has been limited to the documentary style of wedding photography; I'm not sure I have the skill set for the real-wedding picture-extravaganza.. it's all good, each to their own. The flip side of the question "do you photograph weddings?".. .."not often" "just friends really". Is that I am often asked by bridal designers "can you photograph wedding dresses?" the answer is "of course!" Creating feeling; bringing out details, hopes and desires, that is exactly what, as a fashion photographer that I do! A colleague of mine has a rather sharp and cheeky reply to that question; "that's a long black evening dress only in white, right?" his point being that maybe it's just another dress.. But of course, as we all know, this is NOT just another dress, it's that very very special dress, it's a dress like no other; a dress that will be the only one like it you will ever need, a truly unique dress, a dress about love for YOUR truly special and unique day! For this Bridal Fashion shoot you are looking at now, I selected a popular Sydney Eastern Suburbs location; we had three beautiful 'real' young women'' as our models and a wonderful Summers day. We also had a great collection of bridal dresses and fabulous positive attitude! But what we did not have, was a real bride or groom; months of planning and anticipation resulting in the big day surrounded by family, friends, the whole wedding thing that creates the atmosphere and the emotion that you see in photographs that are taken at a wedding ceremony on the day. Well we wanted some of that feeling for our pictures and it's here where working with an experienced fashion photographer truly comes into it's own. Working with the designer the dresses and the models; setting the mood, finding or creating the right light to build the right atmosphere, that bridal feeling - on a day where there are no brides , no bride grooms or family to be seen.. No wedding! That is when you need an experienced photographer who can deliver all those emotional and visual elements of the picture you want on-call. Our shoot is in line with contemporary bridal photography, taking advantage of the vintage location and natural light and drawing a focus on the dresses; the feeling is intimate, beautiful and fresh like Australia's outdoor summer lifestyle. So here are quite a few of our dresses in quite a few shots and variations. I love our classic Black and White shots and I love the colour shots too! Can I photograph wedding dresses? Yes I certainly can. And can I capture the feeling of the day too? Yes I can. Do pictures like this sell dresses. Yes, yes they certainly do, and I can photograph your fashion for you too. More pictures and contact details below. If you would like your fashion photographed with pictures that sell, please email or call. If you would like your wedding photographed in a reportage/documentary style; let me know, I can do that for you too. (61) 0433 796 863 Sydney, Australia. Bridal Photography in the Studio, HERE. 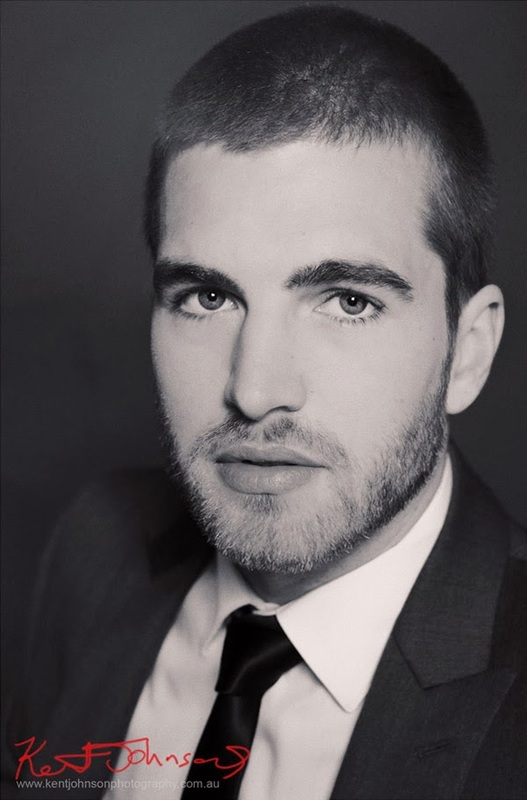 Headshot Photography Part 1 - The Modelling Portfolio Headshot. While putting together the new Modelling Portfolio Headshots page on my website over the past week; I got to thinking about what's involved in making a great headshot and the wide variety of pictures that we all call a Headshot. And I was quite surprised as I went through many pictures from many shoots, at just how many different types of headshot there can be. Some are more fashion, some more portrait some are this and others that! 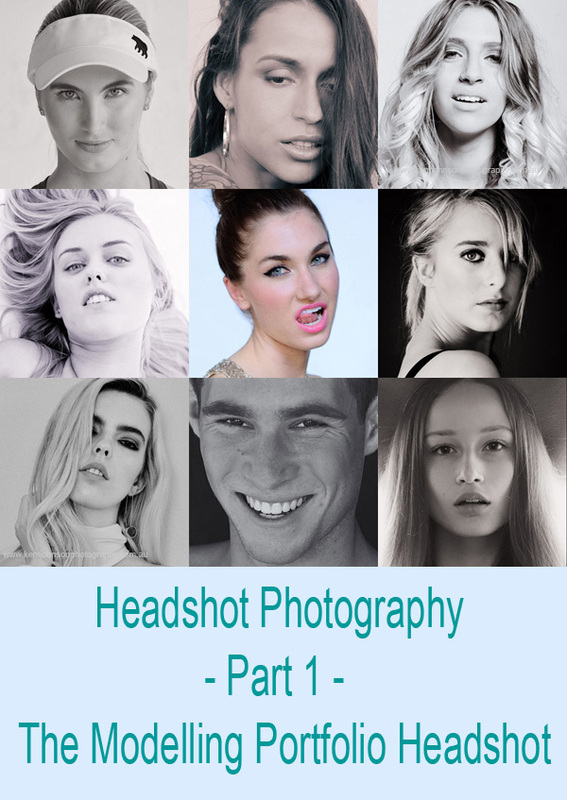 So I've decided to write a series of blog posts about the different headshot types. In this blog I am going to look very specifically at what I think makes a good Modelling Portfolio or Comp Card Headshot, and my approach to making them. In later blog posts I will look into other aspects of Headshot photography that is often called something else; Beauty photography comes immediately to mind.. But right now it's what makes a Modelling Headshot and how I take them. So what is a Model Headshot and what makes it different from say a portrait? I think the BIGGEST difference is the intention that the picture is going to be used for. "Intention; what does that mean?" If you think about modelling, it's all about fashion pictures and runway shows, its all about clothing and products; and sometimes its about the models themselves, but by the time a model has become that successful; they have already become a perfect fashion face.. The intention of a great headshot is to grab the viewer, to hold them and even to beguile them a little; its a hook to catch the viewer with, to book jobs with, to launch a career with. A picture to never forget! The intention is very important and it's the photographer working with the model that creates that special intention which is why you really do need a photographer who understands what fashion and modelling is all about. I suppose one of the first things I should say is that although I make a lot of headshots; I do not have an exact formula for creating the perfect headshot. Just as no two models are the same no two shoots are exactly the same, there is no 'set' lighting; I approach every portfolio and headshot shoot as an original. But something that is the same on every shoot is this; to get the best pictures of the model possible; not just good shots, great shots; that goal is always the same. On most of my folio shoots the team and I work through 3 or 5 looks including hair and make-up changes, and as you can never really predict which look is going to deliver that killer headshot; I always stay aware of possibilities for a headshot while shooting. I do this by changing my relationship to the model as I shoot; this may mean moving in closer to see how the face responds to a certain lens, or changing lenses to change the perspective of the face. All the while chatting away to the model and setting the tone of the shoot. But I seldom think only about the face. A portfolio shoot requires a range of different shots and different fashion looks so I concentrate on getting each-shot each-look in the bag and all the while; keep looking for that special moment, the 'correct' mood and attitude that will make the perfect headshot. Of course I direct the model as well and as you can see from the screen shot "proof sheet sequences" below; sometimes I move in and out of a variation on pose that is working to keep it fresh while at other times it's better to slowly work with minor changes. It's about being sensitive to the model and the process of making the picture. Changing the camera set-up created a different energy while photographing the same 'look'. Different crops and a B&W conversion from the same image. For Natalia's portfolio shoot and headshot you can see the sequences below, we are moving through variations in a seated pose, slowly coming closer creating a tighter frame, capturing the intimacy and energy of the moment. The process created a number of possible headshots as well as many good options for selecting the most suitable lingerie shot too. No matter that every shoot is different, the fundamentals are always the same; first, set the model at ease. I often take some 'Polaroids' at the beginning of the session before Hair and Make-Up to break the ice, and these shots are useful as agency Digitals. Beautiful hair and make-up, of course, but not too overpowering; its about the model not the make-up. Even no make-up at all can work as in Caitlin's hat shots below. The right light! There are no lighting diagrams on this post because I do not have pre-used lighting set ups. I believe every face is different and deserves it's own light, experience with lighting equipment (including the the sun) and at reading light, and not relying on what worked last time keeps the pictures fresh. Black and White or Colour? Thankfully with digital this no longer has to be a permanent choice, though when I feel a shot is B&W I tend to set the camera to shoot in B&W with the option to convert back to colour from the RAW file.. I have long loved Black and White photography for its ability to streamline detail; and as such Black & White is still very popular for headshots. How much of the body should be shown in a modelling portfolio headshot? Typically all of the head though often cropped into the hairline at the top of the frame, the picture most often finishes just below the neck above the breasts, but not always; it can be tighter or longer, though I do not think I have ever seen a full length image on the front of a comp card. Still, there are no hard-and-fast rules here other than the one rule; the best picture possible; the strong, the distinctive, the great shot, the killer headshot. That said modelling agencies will very often have a very particular idea of how they feel a model should look on their comp card and in their portfolio; and that will be the look for the market that they are selling a model into. Think categories like Fresh Teen vs. smouldering Femme Fatale! If your agent has you pegged as 'natural and fun teen' market there is no way your headshot is going to be of you as a smouldering Femme Fatale; even if you can pull it off; that shot will most likely have to wait for another time, at least to go into your book. The best picture will be the best picture of you as the agency sees you-and-your-market. Modelling is a business after all. So the headshot does not only represent you at your best, it also represents your 'look' in the marketplace which is an intent very very different from a simple personal portrait. The picture will be a rectangle, vertical, 'portrait' and not horizontal, to optimise the card and so your picture fits on the website and the wall at the agency along with all the other models cards at the agency. And these days, I think that even though I have never seen a square headshot on a comp card, its not too bad an idea to have a headshot that can crop square for Instagram too. And lastly if you have any questions about Headshots I am more than happy to have a shot at answering them in the comments section below. Thanks for reading and you can follow me here on Blogger or on Facebook to keep up-to date with more Headshot and Photography posts to come.